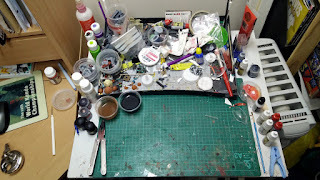 With the Man Cave's case of Nurgle's Blight [which I've been keeping on top of and preventing outbreaks with judicious anti-mould spray applications] I've been a little down on the whole hobby room enjoyment but I realised in part it was becaus of how untidy my workspace was. 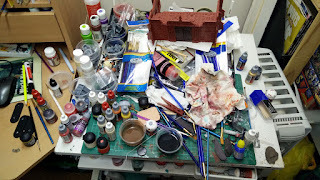 I'm untidy at the best of time but the apathy and constant shifting of the paint table meant I just didn't care. The fact is I sit facing the computer anyway so the paint space is irrelevant. It was annoying me though and depsite not wanting to sacrifice a good deal of hobby time rectifying the situation I arrived at a moment where that was possible, because there really wasn't very much else I could do in that time. Now some would say this isn't much better, and I admit since this picture it's begun to deteriorate yet again. However, I cannot underestimate the feeling I got from this experience. I'm sure there's a single word, like schadenfreude, untranslatable from another language that would explain the feelings I had whilst doing it. It's a sensation I've had numerous times before of 'rediscovering something long lost, like a memory from childhood', it's a peculiar mental process that then evolves into an emotinal one, not unlike losing The Game [Tom Widdows]. It's quite a nebulous emotion that when I feel it I keep reaching inside to capture why it make me feel that way. They've all combined to sap will and its worth me noting that a simple tidy up has done wonders to my psyche, so I best keep it up and not leave it so long next time. I know that feeling - whilst I don't have a dedicated painting space, I'm forever needing to tidy up the garage, where I work on scenery and keep stuff. I think the problem is I work right up until the last minute i have available and don't leave time for tidying. You can't beat that satisfying feeling though of having a good place to work in - I love my daughters very much but I do miss my desk! Dammit dave I just lost the game! I know what you mean about painting space. my wife is good enough to let me keep a tray that has my paints and stuff underneath of coffee table. that means I can just do a little bit here or there, without ever really needing to go to a certain space. it also forces me to keep it tidy as its a portable thing in a communal space! I think that's tidy compared to mine at the moment Dave,ever time I do tidy it I tell myself I'll keep it that way but it never happens. I know what you mean. Sometimes there just seems too much to do, and no forward progress. You're definitely doing better than I am on the tidying front, though! Good luck with the rest of it, too!